Arts marketers are constantly under pressure to justify every pound they spend against the return they achieve – and a good loyalty-based, or CRM (Customer Relationship Management), approach will help you do just that. This article is an attempt to demystify segmentation and show you that you’re probably already doing it, but may not know it. Town Hall and Symphony Hall (THSH) in Birmingham are two large-scale receiving venues presenting a variety of performances a year, focused largely on music. Since the re-opening of Town Hall in 2007, the organisation was keen to undertake a comprehensive segmentation of its customer base to better understand its audiences, and to further develop its audience-focused approach to communications. 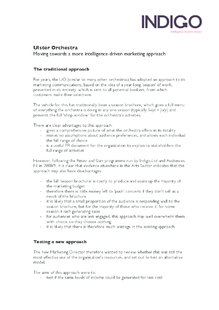 Ulster Orchestra tested whether the benefits of a season brochure outweighed its costs. Working with Indigo, the orchestra segmented their data, based largely on frequency, but also looking at artform crossovers. Do you want your marketing budget to stretch further? Do you want to improve the effectiveness of your marketing campaign? Do you want to get audiences to visit more frequently? Katy Raines (Partner, Indigo) is regarded as one of the UK’s leading consultants on CRM and Segmentation for the Arts, and as such has developed and led research and implementation programmes for large and middle scale organizations throughout the UK. She has a particular passion for using audience data to effect change, and drive an audience-led approach to marketing for any arts organization.